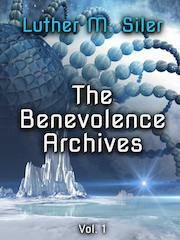 Benevolence Archives review–it’s free this weekend! This is the idea behind The Benevolence Archives, a collection of six short stories by Luther M. Siler–I found BA through his blog Infinitefreetime, which is a riot and a half. I enjoy his blog so much, I figured I’d give his actual writing a shot, and I must say I did not regret it. This collection is available for Kindle from Amazon, and you can get it for free this weekend! The BA stories follow a team of spacers for hire: half-ogre Grond, whose murky backstory involves time spent in a brutal gladiator arena, and gnome Brazel, whose wife Rhundi acts as the team’s legit front and sometimes fence. These two have really fun chemistry; throw in a couple interesting side characters and a snarky ship and you have a really enjoyable cast. DRM – should you use it?